One of the greatest showmen in sporting history was born on this day in 1959, in Lansing, Michigan. Basketball legend Earvin Johnson - much better known by his nickname "Magic" - first led his local Michigan State Spartans to the 1979 NCAA title defeating his long-time rival & friend Larry Bird and the Indiana Hoosiers. The Los Angeles Lakers made Magic the first overall pick of the 1979 NBA Draft and led L.A. to 5 world titles, while he was elected a 12 time All-Star and ended up in the Hall of Fame. He also led the USA Dream Team to Olympic gold in 1992. 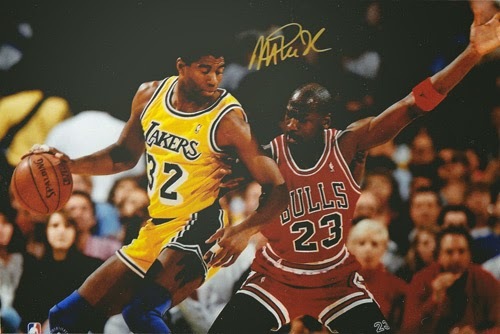 Here is Magic in action for the Lakers against fellow NBA HoF Legend Michael Jordan. For more Basketball & US Sports Memorabilia, visit us at Uniquely Sporting.